Manning Meadow Reservoir is located on Monroe Mountain in the Fishlake National Forest. It is a fairly remote reservoir popular for fishing. The Central Utah Health Department has lifted the Warning Advisory for Manning Meadow Reservoir. Toxin test results and cyanobacteria cell-count concentrations from samples collected on August 7, 2018, were below recreation health-based thresholds, prompting health officials to remove the advisory for the reservoir. Cyanobacteria cell-count concentrations from a sample collected August 4, 2018, in Manning Mountain Reservoir showed cell counts of 17,610 cells per milliliter (cells/ml). While these cell densities fall below the recreation health-based threshold for a Warning Advisory for cell counts, the advisory remains in place due to anatoxin-a levels that exceed the toxin threshold. The Central Utah Health Department has issued a Warning Advisory for Manning Meadow Reservoir due to anatoxin-a levels that exceed the recreation health-based threshold. While anatoxin-a levels were relatively low (0.11 micrograms per liter (µg/L), the presence of the toxin triggers a Warning Advisory. Health department officials are posting signs today to alert visitors of the advisory. 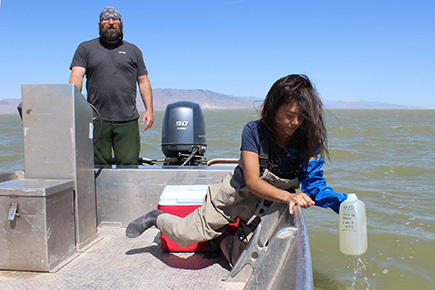 Lab results from the Utah Public Health Lab (UPHL) for the sample collected at Manning Meadow Reservoir on August 7, 2018, showed anatoxin-a levels of 0.11 micrograms per liter (µg/L), which exceeds the recreation health-based threshold for a Warning Advisory. Microcystin levels of 0.14 µg/L.were well below the advisory threshold. The Division of Water Quality (DWQ) visited Manning Meadow Reservoir on August 7, 2018, and reported that the southern end of the reservoir near the dam looked better compared with the last visit. However, the crew also observed cyanobacteria dispersed throughout the water column. DWQ took an integrated sample for anatoxin-a and microcystin as well as a phytoplankton sample. The microcystin test strip had an invalid control line, but tests showed the anatoxin-a levels exceeded the recreation health-based threshold for a Warning Advisory. Both samples were sent to the Utah Public Health Lab (UPHL) and Utah Department of Agriculture and Food (UDAF) labs for toxin confirmation. July 16, 2018 Manning Meadow. Lab results for the sample collected July 19, 2018, showed anatoxin-a levels of 0.81 micrograms per liter (µg/L) and toxigenic cyanobacteria cell counts of 5,763,310 cells per milliliter (cells/ml). Toxin levels and cell-count densities exceed recreation health-based thresholds for primary contact such as swimming and ingestion of reservoir water by pets or livestock. The phycology lab noted that the bloom appeared to be decaying, so it may not pose a threat at this time. Visitors should still exercise caution in areas of the reservoir that appear to be experiencing blooms. 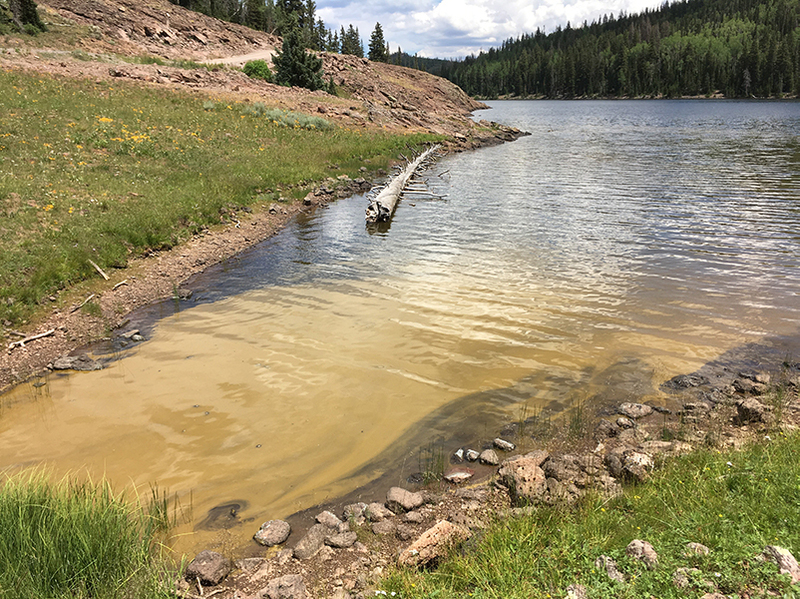 The Central Utah Health Department received a report on July 17, 2018, of a possible bloom on Manning Meadow Reservoir. Microscope investigation of a sample indicates a possibility of gloeotrichia, a genus of cyanobacteria that generally doesn’t produce high toxin levels (e.g., microcystin), but which can produce high toxin levels if cell-count concentrations reach into the millions. Potential cyanotoxins microcystin and anatoxin-a were not detected when analyzed using strip tests.